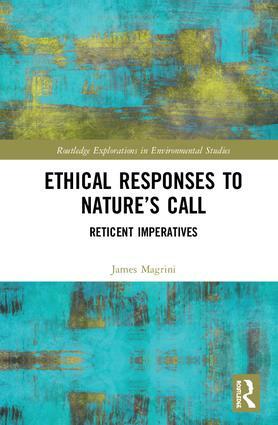 Arguing for a renewed view of objects and nature, Ethical Responses to Nature’s Call considers how it is possible to understand our ethical duties - in the form of ethical intuitionalism- to nature and the planet by listening to and releasing ourselves over to the call or address of nature. Blending several strands of philosophical thought, such as Graham Harman’s Object Oriented Ontology, W. D. Ross’s Prima Facie Ethics, Alphonso Lingis’s phenomenological ethics traceable to The Imperative, and Michael Bonnett’s eco-philosophy, this book offers a unique rejoinder to the problems and issues that continue to haunt humans’ relationship to nature. The origins of such problems and issues largely remain obscured from view due to the oppressive influence of the "cultural framework" which gives form and structure to the ways we understand, discourse, and comport ourselves to the natural world. Through understanding this "cultural framework" we also come to know the responses we continue to offer in response to nature’s call and address, and are then in a position to analyze and assess those replies in terms of their potential ethical weight. Such a phenomenon is made possible through the descriptive-and-interpretivemethod of eco-phenomenology. This renewed vision of the human-and-nature provides direction for our interaction with and behaviour towards nature in such a way that the ethical insight offers a diagnosis and provides a potentially compelling prescriptive for environmental ills. James Magrini is Adjunct Professor of Philosophy and Ethics, College of Dupage, USA.